In a video, a passenger in a vehicle screams: "Oh my God, I want to go!" as nearby trees burst into flames. "I can't breathe," the woman says, sobbing. "Please, guys, come put it out." The Delta Fire erupted Wednesday afternoon in a rural area and devoured timber and brush on both sides of Interstate 5 as it nearly tripled in size overnight, officials said Thursday. 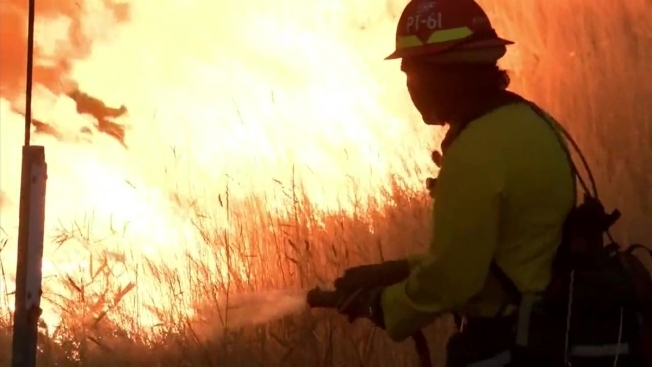 A fast-growing wildfire in Northern California prompted officials Wednesday to close both directions of Interstate 5 connecting California and Oregon and issue evacuations. Sergio Quintana reports. The blaze had scorched 22,000 acres, or 34 square miles, and was at 0 percent containment as of late Thursday, the U.S. Forest Service said. Interstate 5 in the area will remain closed until further notice, Caltrans officials said. Elsewhere in the state, a fire raging in the Sierra Nevada had grown to more than 7 square miles after shutting down stretches of U.S. 395, State Route 108 and the Pacific Crest Trail along the eastern spine of California. The two fires Thursday were raging just weeks after a blaze in the Redding area killed eight people and burned some 1,100 homes in a frightening start to the fire season. California's insurance commissioner said Thursday that victims of that fire and one in the Mendocino area — the two largest blazes in the state so far this year — have filed more than 10,000 claims so far totaling $845 million. The two fires destroyed or damaged a combined 8,800 homes and 329 businesses. "The worst may be yet to come," Commissioner David Jones warned at a San Francisco news conference, noting that California wildfires are typically more destructive after Sept. 1. The Delta Fire was moving rapidly but was still far from any large towns, officials said. Officials from a number of agencies were meeting Thursday to determine if they can reopen the highway, a key route for commercial trucks, California Highway Patrol Officer Jason Morton said. The highway runs north from the Mexico border through California, Oregon and Washington state to the border with Canada. The scattered homes and cabins in and around Shasta-Trinity National Forest were under evacuation orders, from the community of Lakehead north to the Siskiyou County line, said Chris Losi, a spokesman for the forest. "It isn't a lot of people," he said. The blaze was human-caused, officials said, without indicating whether it was arson or an accident. About 17 big-rigs were abandoned along the interstate and at least four caught fire, Lt. Cmdr. Kyle Foster of the California Highway Patrol's Mount Shasta office told the Los Angeles Times. At least two trucks were partially melted. U.S. Forest Service workers helped the driver of one flaming truck to safety. Truckers, firefighters and others aided more drivers. 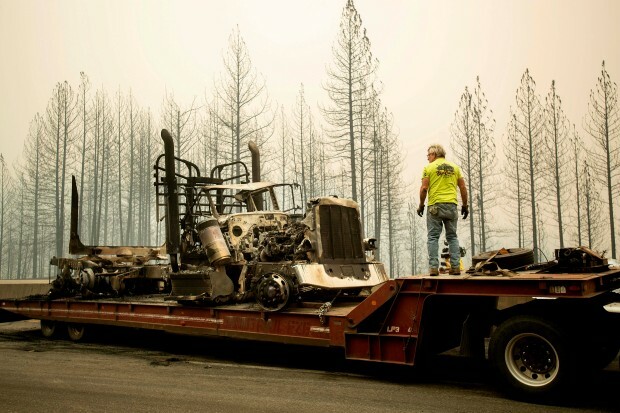 "There's vehicles scattered all over," Brandon Vaccaro of the California Department of Forestry and Fire Protection told the Redding Record Searchlight. "Whatever occurred here was probably pretty ugly for a while." About 45 miles of I-5 were closed in both directions, Losi said. The blaze also delayed Amtrak's Coast Starlight train service between Sacramento and Oregon. The city of Dunsmuir, with about 1,500 residents, was about 15 miles from the flames. Residents were urged to be prepared to leave if the fire threatened.